We are excited to feature John Scott, Service Manager, as our Feature Friday interviewee this week. 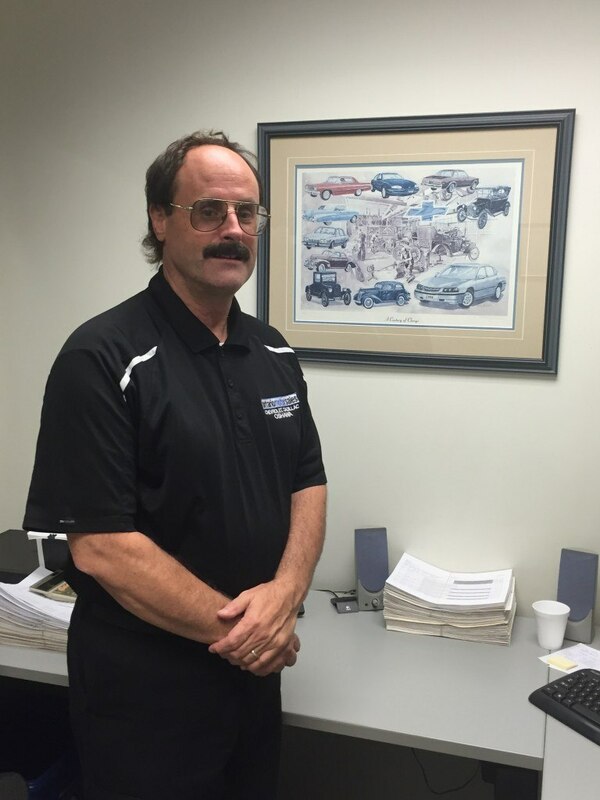 Please scroll down to read about John's take on life around the dealership. It’s great being a part of a well-established and well-run business. I always wanted to work in the automotive business, so I jumped at the opportunity to work here when I had the chance. After 38 years of working here, my family identify with the dealership too. I remember when my son was three years old, we were watching TV one night and saw a General Motors commercial. He pointed at the screen and said “Ontario Motor Sales!” My wife teaches piano and not long ago, one of her students came in wearing an Ontario Motor Sales Kicks soccer shirt. OMS is a big part of the community and that’s really important. I think it’s been seeing the technological advancements over the years. So many things have changed… When I started, cars had carbureted engines and AM/FM radios (power antennas were considered luxuries! ), but now we have fuel injected engines, monitor systems, navigation systems, and blind spot warnings. With the Volt we’ve even seen the beginnings of electric vehicles! Warranties have changed a lot throughout the years too. I can remember a time when standard warranties were 1 year/20,000km and powertrains were 2 years/40,000km. Now most new vehicles come with 3 years/60,000km standard warranties and 5 years/160,000km powertrain warranties or better. I always try to listen and analyze what the customer’s needs are. I’m also sure to involve the resources we have, either through us or through GM, and between the two of us, we can usually get customers’ concerns resolved. Unfortunately, we can’t always give every customer everything they want, but we have a lot of options and are great at coming up with solutions. Our employees are dedicated to customer satisfaction. People have come in early, stayed late, worked through lunch, or even come in during vacation days just to help our customers. We have that a lot in all of our departments. I can remember a story from a number of years ago when we had a customer come in right at the end of the day on Christmas Eve. He needed a fuel filter, so Tony Budkowski stayed late to install it for him. He called John Urquhart to come in and help him find the part, and between the two of them, they had that customer’s car ready in time for Christmas. We won that customer by doing that—I still see him coming in, years later, to get his service done. The Oshawa Creek used to rise a lot during inclement weather and I remember sandbagging the back doors to prevent flooding in the shop. We had a tractor on the lot in those days to plow snow and do other things like that, and I recall somebody driving it between the dealership and the baseball stadium to try and avert the flood during one bad case of it about thirty years ago. That turned out to be not such a great idea, as he accidentally buried the entire tractor in the flood! We did end up getting a tow truck to pull it out though, and the driver was never injured in any way.